Over the last 22 years Powersoft has proudly supplied the Pro-Audio industry with power amplifiers of the highest quality and efficiency. During these 22 years, almost one million channels have been sold and distributed worldwide. To celebrate, Powersoft has set up a promotional campaign that aims to speed up the process of reaching this momentous milestone. The promotion gives you the opportunity to win the entire order that has been placed whatever value it may be. So the more channels you order, the more chances you have to win! 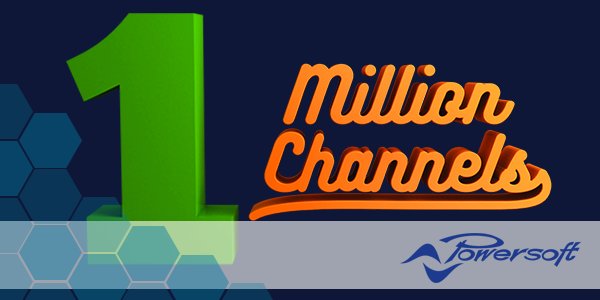 Once the millionth channel sold milestone has been reached, Powersoft will be streaming a live lottery style extraction of the lucky winner. The winner will be granted a coupon of the same amount of the winning order, to be spent on the next order by December the 31st 2017. To participate in this giveaway follow this link and the instructions within: http://onemillionchannelspage.powersoft.it/. You will then be contacted by us so that we may process the order, giving you the possibility to win the loot. Click here to win back the value of your order!